The weaker side needs to keep Knight close to his King in order to achieve draw. There are some special cases where the stronger side wins even in those situations, like when Knight is cornered or pinned in such a way that puts weaker side in zugzwang. 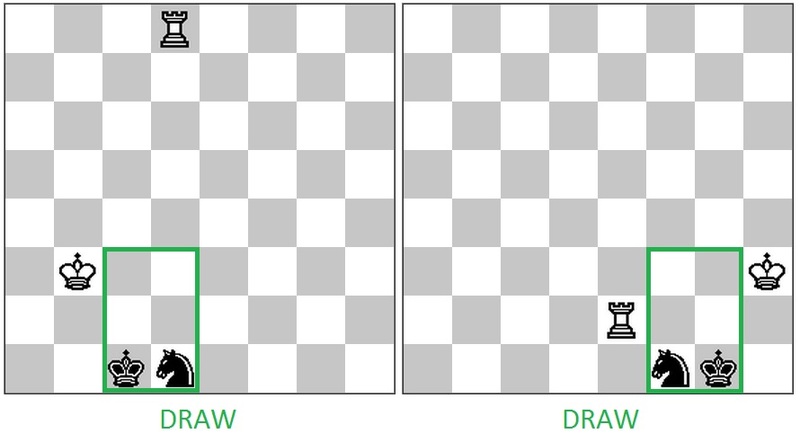 If the Knight is far away from the King then the result of the game depends whether or not the defending side is able to connect his pieces. It is useful to mention that in these position the defender should not allow vertical opposition( e6-e8 in the above example ), but should strive for the diagonal one( e8-f6 or e8/d6 ). The defender must keep his pieces together and avoid being cornered. Maintaining diagonal opposition with kings is desired. Corner the opposing King and then execute double attack with the rook which threatens mate and attacks the Knight. Corner the Knight and create zugzwang. Push away the Knight as far away as possible from his King and then trap him. In some special cases, exploit bad piece coordination to create decisive zugzwang. Y.Averbakh - Comprehensive Chess Endings Volume 2. In analyzing and studying this endgame, I believe I have found a very simple way to explain the defensive technique (for this example, we will consider the defender to be Black). Once I learned this technique, I played some blitz Rook vs Knight endgames vs top chess programs and drew all of them. I found it useful to visualize the technique in term's of a box. Consider the knight on d1 (below). The knight can be visualized in a vertical box either to its left or right as shown. 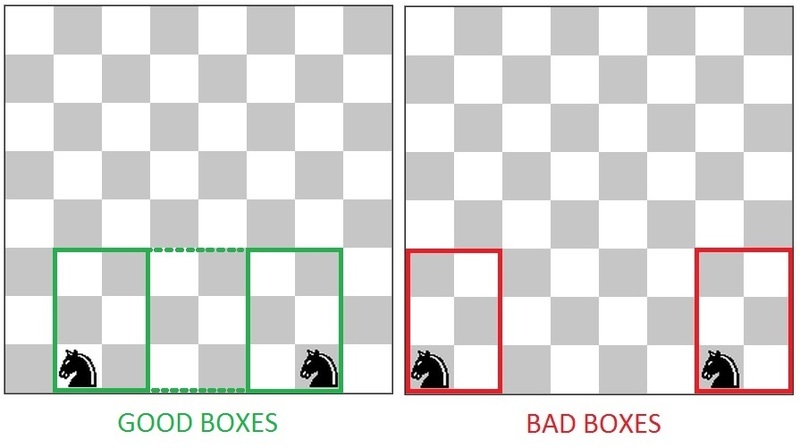 Note that the box is always vertical to the base of the knight. 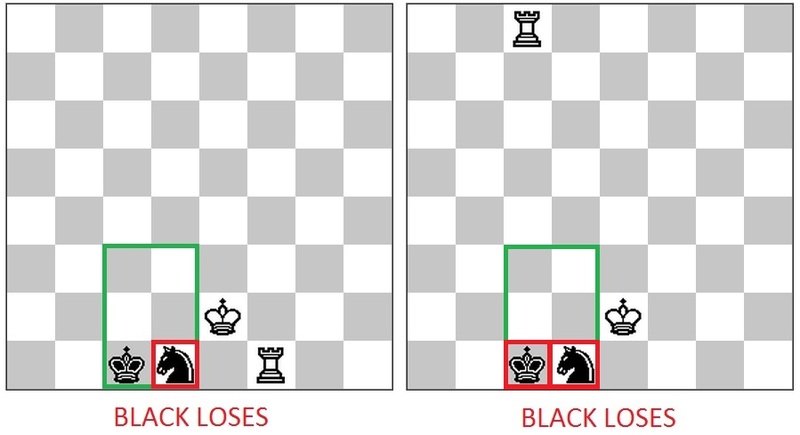 In my analysis and study, I found that if Black can place its own king in the knight's box, and keep the opponent's king out of the box, then Black can hold the draw. Note that the knight's box only works on a non-corner box. Thus, the green boxes below work, whereas the red ones don't. Another exception is when the knight is pinned by the rook and the opponent king also attacks it at the same time, or when the opponent king attacks the knight and also checks the king with the rook. Here is a sample blitz game I played against an engine that demonstrates this technique. Not ALWAYS close to the King! Although it generally helps to keep the king and knight together, it should be noted that there are some tricky positions where it is not desirable to keep the knight and the king together. This usually happens when the knight is on the b2, b7, g2 or g7 squares as shown below. This is an important position in Rook vs Knight endgames. Here, after White plays 1. Kc3, the move 1...Nd1, which keeps the knight somewhat close to the king, loses. Instead, 1...Na4+ draws. Not the answer you're looking for? Browse other questions tagged endgame draw knights rooks or ask your own question. Can black win in this KR vs. KN endgame?